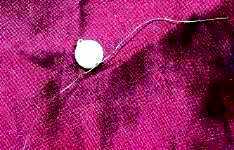 For the decoration of bodice, sleeves and skirt of my ‘Pelican’ gown, I needed “Quadruples”. 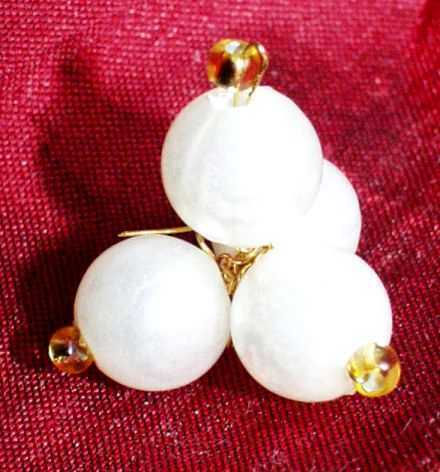 I’m calling them by this name because the “usual” Elizabethan decoration are “Cinques” (which are – in the Pelican Portrait – only used on Elizabeth’s necklace) – “Fivepacks” of pearls, arranged in a geometric way; and their origin is Spanish – the Spanish word for “five” is “cinque” – but those decorations on the “Pelican” gown only consist of four instead of five pearls, so – “Quadruples”. These pictures are, actually, the best proof that digital cameras hate the color red. Take a piece of fine gold wire, approximately half a yard long (as long as you can handle without dangling it). 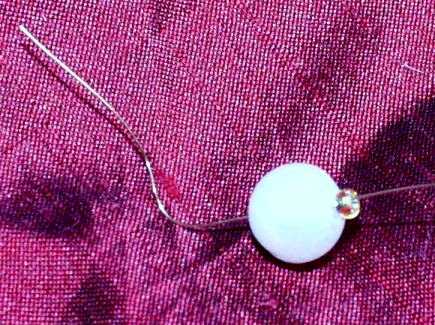 Add one pearl, leaving an end of about 1 1/2 inches of wire behind that pearl. …then bring the longer end of the wire back through the pearl (and *just* the pearl, *not* the golden bead!) by practically running it backwards the way it came from. 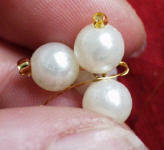 The golden bead will prevent the wire from slipping back through the pearl. 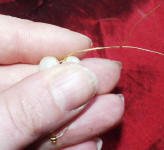 Result: One pearl with a golden bead on one hole and two wires – one short, one long – coming from the other hole. Twist the wire a few times *in* the hole. 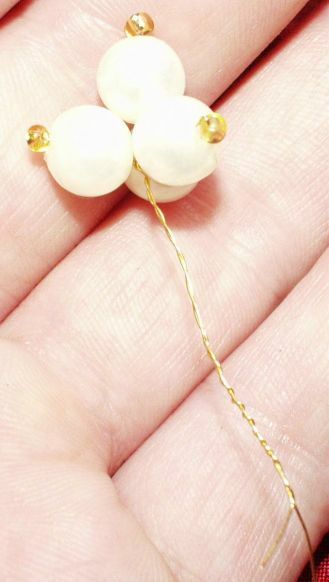 Repeat that process with another pearl and bead, just that this time you’ll want no end of wire, but the holes of the (now two) pearls where the ends of the wire emerge from as close together as you can. 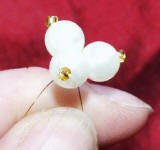 Repeat the process for a third pearl and bead, so that you get a triangle-shaped arrangement of pearls. 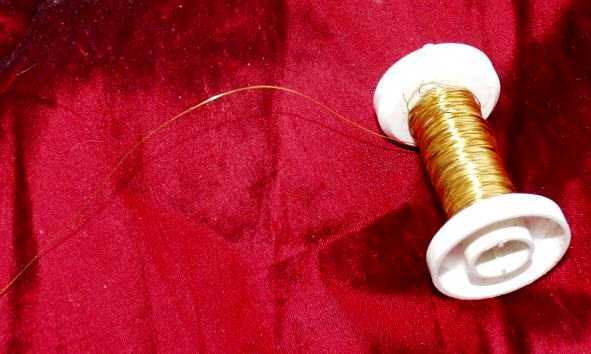 Twist the short and long ends of the wire two to three times, to secure that triangle shape. Now bring the long end of the wire from the bottom side (you decide what the “bottom” shall be 😉 ) of that triangle middle to the top. 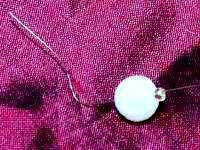 Add another pearl and bead, bringing the long wire end back to the bottom. 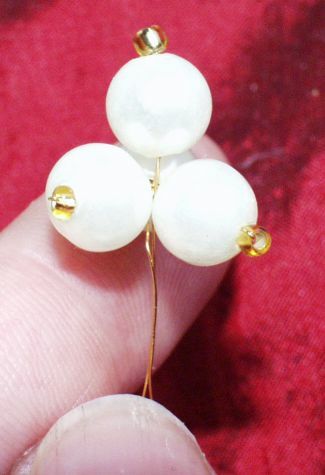 Twist several times around the base of the upper pearl. 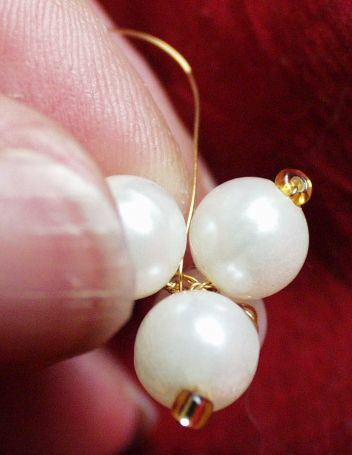 If needed, make “8” shaped movements with the wire around the outer pearls to bring them closer together. 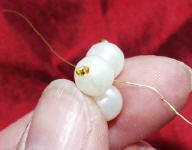 Cut wire if you think you have a tight packet of four pearls with beads and a loop at the bottom. Time factor? With practice, I could do one “Quadruple” in about 5 minutes… breaks for cursing dropped pearls, restarting because of too short wire etc. 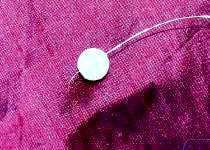 not included… So all in all about 7 minutes actually for one Quadruple – so 7 hours for all of them – if I would have worked without a break – which I didn’t…. In other words, it took me almost two weeks just to finish those particular decoration elements. 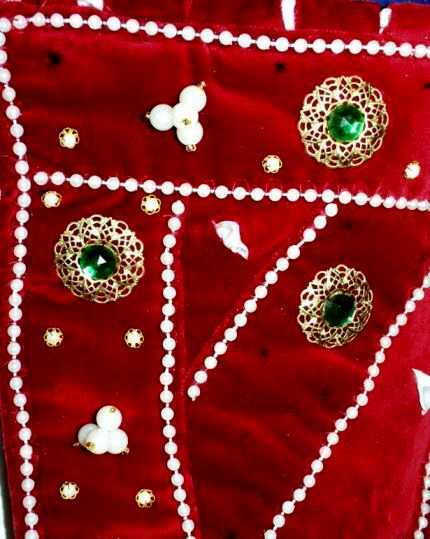 I then started decorating the bodice with those “Quadruples” and the smallest golden disks with green stones, following the pattern from the portrait and inventing a likely pattern for the backside of the gown (which of course can’t be seen in the portrait). Here’s a little of that decoration (some of the half sphere caps, which will be described in the next chapter, are also already sewn on in this picture): You can also see the markings (made with a water removable marker) for the placement of the pearls, disks and Quadruples.